When director of the Butler Gallery Anna O’Sullivan first approached animation studio Cartoon Saloon and invited the team to consider collaborating on an interactive exhibition at the gallery, neither party realised the extent of what the partnership would achieve two years later. Their project, ‘Song of the Sea: The Exhibition’, won the Best Mid-Size Sponsorship category in the Allianz Business to Arts Awards and was clearly a win-win for both Kilkenny-based partners. The exhibition invited visitors behind the scenes of the Oscar-nominated film, delving into Cartoon Saloon’s rich archive of hand-drawn and painted scene studies, investigating prop and character design, learning from animator in residence Rory Conway and stepping into a 3D realisation of a scene from the film. The outcomes were extraordinary, not least a footfall of 50,000 for the gallery between July and October last year compared to its usual total annual footfall of 60,000. In turn, Kilkenny was the highest grossing cinema location for Song of the Sea only behind London and Dublin. Beyond this, the venture attracted extensive national media coverage and led to an unexpected national tour supported by the Broadcasting Authority of Ireland which brought the exhibition to Linenhall Arts Centre in Castlebar, Co Mayo, Siamsa Tire National Folk Theatre and Arts Centre in Tralee, Co Kerry and The Ark in Dublin. “When Anna came to us and was so excited about what we could do in the space it was hard not to get excited with her. The timing was fantastic as it was so far in advance of the release of Song of the Sea and could really tie in with that,” explains Catherine Hehir-Roycroft, studio manager at Cartoon Saloon. “The exhibition gave us more than we could have ever imagined. As well as branching out into the new world of exhibitions, Cartoon Saloon became more recognisable locally and interest grew from there. Arts and museum spaces made themselves known to us and we have been holding Q&A sessions and workshops. We want to be seen as a tool of education for the animation sector and are beginning that journey. 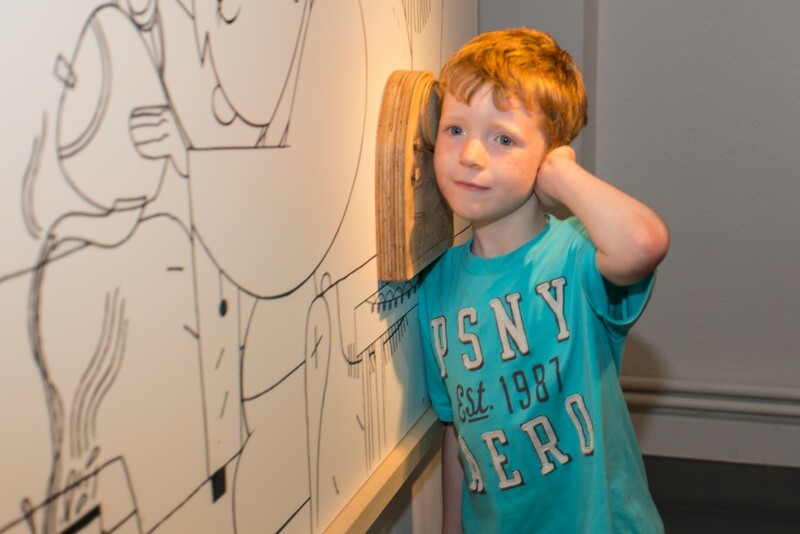 According to O’Sullivan, one of the many great successes of the partnership came as a result of engaging Cartoon Saloon’s staff of highly skilled animators with the Butler Gallery’s education and public programme. “Both National Drawing Day and Culture Night proved the perfect opportunity to harness the skills and enthusiasm of the animators, who worked with me to plan innovative animation-based activities for participating visitors,” she says. It became clear that in order to realise the exhibition the way both partners envisaged there was a need to raise additional funds. Working closely together for over a year prior to its launch, Cartoon Saloon and the Butler Gallery developed a fundraising strategy and secured grants and sponsorship from a number of sources including ID2015/Year of Irish Design, Grant Thornton, Animation Skillnet and Kilkenny County Council Festival & Events Award. The Butler Gallery managed the curation of the exhibition, starting by reviewing hundreds of drawings at the studio. The extra funding allowed it to engage with a number of specialists including PR consultant Christine Monk ,industrial design studio Designgoat and projection mappers Lightscape to ensure the exhibition would be interactive and engaging for visitors. .
“The real key to our partnership with Cartoon Saloon was the power of the two of us coming together as a business and a gallery approaching our combined contacts to fundraise a decent budget,” says O’Sullivan. Song of the Sea: The Exhibition has been such an all-round success that Cartoon Saloon are looking at developing a future exhibition to accompany the animation studio’s latest feature The Breadwinner, which is currently in production and due for release in 2017 in the US and Canada and 2018 in Ireland.